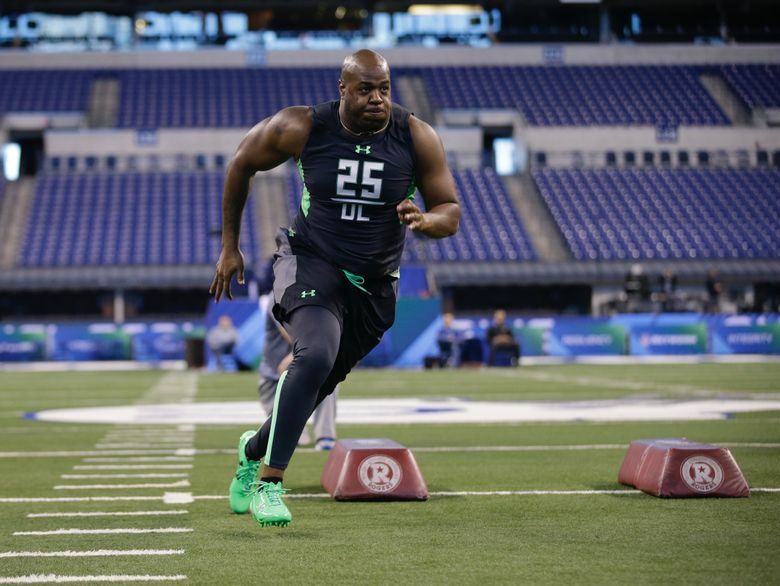 Defensive tackle Quinton Jefferson had the second-fasted 20-yard shuttle time at this year’s NFL combine. The Seahawks added more depth along the defensive line in the fifth round with the pick of Maryland defensive tackle Quinton Jefferson. Personal: Jefferson is married and has three young daughters, including twins. His oldest daughter is 5, and his twins turn 2 in July. “I was already motivated from the jump,” he said, “but having them just added. Everything I do is for them, my wife. I want them to have a good life. I want them to be that role model and show them they can do anything they want.” He broke his jaw in a fight and had to gray shirt. He spent that year working at Best Buy. He tore his ACL three games into the season in 2014 but responded to have a solid senior season in 2015. Scouting report: The Seahawks needed to add depth along the defensive line, and in this draft that’s what they’ve done. Jefferson has played defensive end and defensive tackle in college, and the Seahawks like experimenting with young players to see where they fit. The Seahawks could opt to try Jefferson as a big, run-stuffing defensive end, similar to what they did with Red Bryant a few years ago. Or he could play as a three-technique defensive tackle — the spot held by Ahtyba Rubin. Rubin will turn 30 before this season, and Jefferson could provide depth this year while giving the Seahawks an option in the future.